Want your blowout to last through an intense sweat session? Use these hacks from Head & Shoulders celebrity stylist Sunnie Brook Jones to get "I worked out like this" hair—in a good way. Slip on a headband to absorb sweat from the two areas that typically get the most soaked—your hairline and the nape of your neck. 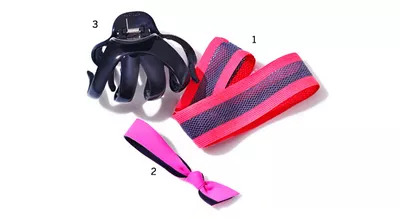 The Remington Active Style Gel Grip Headwrap ($6; target.com) has hidden gel strips to keep the band from moving while you’re grooving. The higher the ponytail, the more voluminous and less slick hair will be when released. Flexx by Emi-Jay Neoprene Hair Ties ($8 for 3; emi-jay.com) conform to hair—not the other way around—and wick away moisture, preventing strands from creasing. Secure a bun with a large clip; hair will take on the shape of the twist with help from your body heat, creating waves once unraveled. The Scünci No-Slip Grip Chunky Claw Clip ($5; walmart.com) is lined with silicone to hold strands in place—burpee approved!